In this article we will cover the differences between ranging and trending markets. You will first learn what each of them mean, and how to identify the current market’s state. Then, once you know how to recognize the sentiment, you will be able to choose a proper trading strategy by using the suitable indicators. For the practical aspect, we will show you an example which is taken from a real trade, and expose the technique that it was based on. Disclosure: We get commissions for purchases made through links in this post. As a trader, you need to know that the market has two main modes: trending and ranging. A trending market occurs whenever prices keep going up, or down, over time. An up-trending market is characterized by higher highs and higher lows while in a downtrend each down movements falls into lower lows and lower highs. In a trading range, on the other hand, up and down movements tend to stop around the same highs and lows respectively. In each one of these scenarios the market behave differently, and each one of them requires different analysis type and technical tools. So before you make any trading decisions, you need to determine what is the current market sentiment. There are several tools you can use in order to determine the current market situation. Remember that this is not an exact science. At certain times, they might contradict each other. Therefore, we suggest that you base your decision on them only when they confirm each other. It’s all a matter of probabilities. So when you combine additional indications that point at the same conclusion, you significantly increase your chances to be right. Now, we will focus on 3 simple ways to use standard technical indicators in order to better understand the stage in which the market is currently at. In order to apply those methods, you will need a basic chart for analysis. Some of the exchanges, such as Binance, offer these tools as built-in features. Another good solution is to open an account with TradingView which is probably the most advanced analysis platform today. Open the chart you want to test and add a 13 EMA. Now, have a look at the direction of its slope. If you see by the angle of the slope that it’s going up, then you know the market is up trending. If, on the other hand, it’s going down – then you have a downtrend. A ranging market will be identified whenever the EMA line has not reached any significant new high or low levels during the past 25 candles or more. Add the MACD indicator to your chosen chart and make sure the two EMA line it consists are set to 12 and 26. Check the MACD and signal line. If the signal line is located above the MACD, it means that prices are now going higher. The same apply to the opposite direction. If the signal line is below the MACD line, it shows you that the prices are going down. In order to identify a trend, you want to see at least 10 candles in a row without a crossover of the signal line to the other direction. It’s recommended to use the MACD in combination with the ADX indicator which we will cover next. The ADX indicator measures both the direction and the strength of a trend. After you added it to your chart, you need to read its 3 lines’ values. First, in order to know the overall direction, check the locations of the two DM lines. If the +DMI is above the -DMI, then the momentum is positive. If it’s below, then this is a negative indication. Once you know the direction, you read the ADX line in order to learn about the strength of the momentum. Only a reading above 25 indicates that the trend is valid and might be significant. A reading below 25 reflects a trading range. 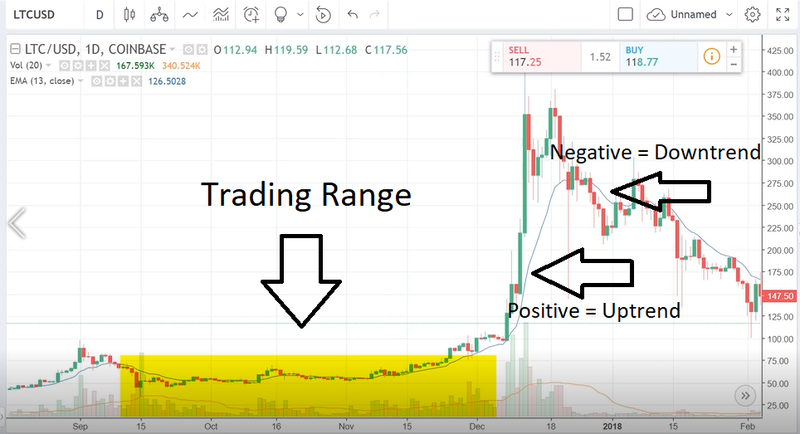 In the image below you can see a daily chart of the Litecoin traded against the USD. This is an example of how we used one of the mentioned indicators, in this case ADX, to make great profits with a real trade. Below the chart, you can see the positive DMI, ADX, and negative DMI lines. They are located next to the green, black, and red arrows respectively. At point A, the positive DMI crossed above the negative DMI. At this stage we knew that the market momentum is slightly positive. But as we mentioned, this is not a sufficient sign. We wanted to see that the momentum has the potential to develop into a serious trend. In order to do so, we had a look at the ADX line level. At point B during the green Marubozu candle, the ADX went above 25, signaling that a meaningful trend might start. This is where we entered a buying trading order of 5 coins at the price of 89.88. Then, at point C, the +DMI was crossing the -DMI again but this time to the downside. This is a signal for a possible reverse, so at this point we closed the position at the price of 252.81. The profit from this trade for each coin was 162.93. So the overall gains for the 5 coins we purchased was 814.65 dollars. It’s very important to understand the market different conditions. Before you make any trade, you have to be able to analyze the chart and realize the current sentiment. The first thing you need to look for, is whether the market is trading or ranging. These are the two main basic situations. In this educational post, we covered some useful tools that would help you with that. Once you understand that, you know which type of signals and indicators to look for in your strategies. And it will be the time to apply some more advanced techniques that will allow you to come out with excellent trading opportunities. In the next article we will cover another trick, that most traders aren’t even aware of. When applied properly, it gives you an advantage over others as it would make your decisions more precise. So stay tuned, and let us know in the section below if you have any questions or comments. Thank you, I learned a lot from these lessons and they were easy to understand, looking forward to more of your content.